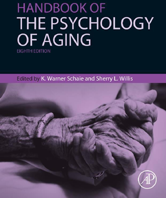 Editors: Schaie, K Warner and Willis, Sherry L.
This updated eighth edition of the most comprehensive text available on the effect of age on psychological processes such as language, cognition, perception, motor control, and social relations provides an important summary of the way the aging process is important to many features of our daily lives, from the workplace and family to public policy matters. What is the Relationship between Amyloid Deposition and Neurodegeneration? Does Amyloid Deposition Invariably Lead to Cognitive Decline? What Is Memory, and What Is Aging? Do EFs Show the Earliest and Disproportionate Decline? Do Brain Regions Linked to EF Show the Earliest and Disproportionate Decline? Who are the Contemporary Oldest Old?